I’m pretty sure this is going to be a bestseller! ¬†Justin Bieber was in NYC on Friday and greeted thousands of fans at a Barnes and Noble for a book signing to promote his debut release, Justin Bieber: First Step 2 Forever. That is so sweet of him! He is so grateful for his fans and he really shows that! didn’t he cut his hair it’s shorter !!!??? justin bieber? dont 4get 2 pray god! coz god loves u! ur no. fan valerie isabela estudillo! I love ur new look, it brings out ur face and beuatiful eyes.PS:My dream is 2 work with Scooter,and I whanto be a singer 1day. hw hot does my futuer bf look? wow! justin i love your new hair cut your look astig that word is great wow i like it and my sister tell me thet my voice when i sing is just like you thats all i got love you idol!!!!!!!! HIS HAIR LOOK SO WIERD!!!!! HE LOOKS OLDER. IM GOING TO SEE HIS CONCERTON THE 15TH OF DEC.!!! CANT WAIT!!! um……did’nt everybody release his hairs short? 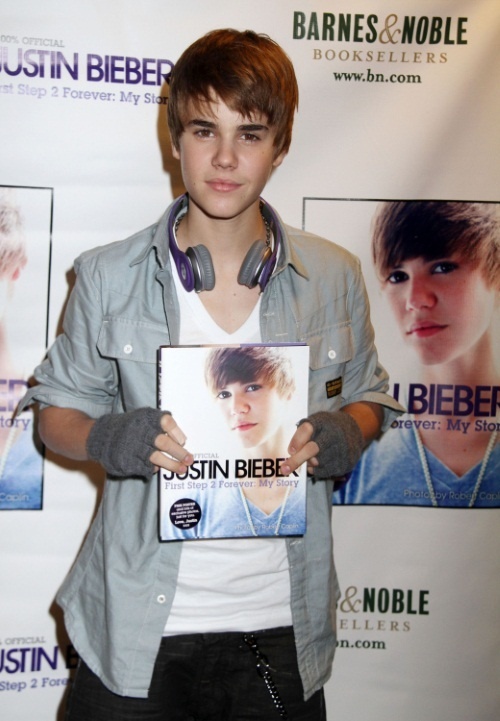 ohhh want to buy that book…uhm what happened to justin bieber’s hair? i love you justin bieber and i read your first book and i will read and your second book.kisses from iliana bakali!!! !